That’s a question I get asked a lot these days. Addressing this challenge is not as difficult as it may seem. 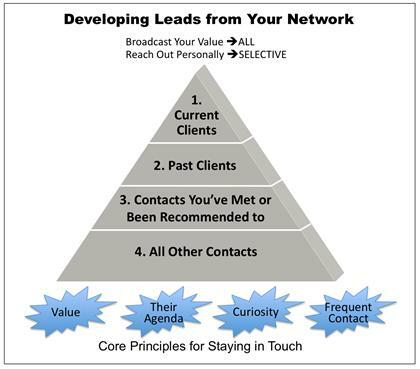 In this newsletter I’ve laid out a very straightforward set of principles and strategies that will help you create new leads out of your network. 1. Add value: Share valuable ideas that demonstrate your expertise and experience. The perception of value—a feeling you can help with an important issue—is the primary driver for prospects to want to engage with you. 2. Understand their agenda: Find out what their toughest problems and opportunities are. Then—and only then—can you tailor your approach to each person. 3. Evoke curiosity: You need to get people to reach towards you and feel drawn to know and understand more about your ideas, points of view, and solutions. If you can make your prospects curious, half the battle is won. 4. Maintain frequent contact. You cannot predict the ups and downs of the stock market, and similarly, you can’t tell exactly when a potential client will have a need that you can address. Just like you need to be invested in the stockmarket over the long term to benefit, you need to be in front of your network on a regular basis, so that when the dam breaks, you’re there to help. Next, there are two main strategies you need to follow in order to operationalize these four principles: You need to broadcast your value and also engage in personal outreach. Let’s look at each one. You should have regular, short packages of value that go to everyone in your network—or, certainly, to all your “followers.” Different people focus on different platforms for distributing this content. I focus much of my efforts on this monthly newsletter and of course my books—which are now being written more frequently and which include short eBooks as an intermediate format. Others concentrate on a daily or weekly blog, on podcasting, on a YouTube channel, and so on. If your content is good and you publicize it, you’ll get people to read what you write. If no one is reading your material, then you need to work harder at your ideas and their presentation. Your articles, blogs, white papers, newsletters, and/or videos should showcase your expertise and experience in a way that is helpful to people. They should NOT be constant advertisements for your services. First, talk to existing clients. They are your best source of new business! Third, talk to other contacts who are potential buyers and who you’ve met at least once. That’s how you should prioritize your personal outreach efforts to existing contacts. You should, absolutely, also be adding new names to your network, but that activity is not our focus right now—leveraging your current network is what this article is about. What do you say when you email, write, or call your contacts? Well that depends on several factors, including: The strength of your past relationship and how well you really know them; how long it’s been since you spoke to them; whether or not they actually know what you do; and so on. You have to use your judgment. For example, you could call up an old client that you know well and just say, “I’d like to catch up with you. I’d love to hear how things are going, and also share with you some new things I’m doing.” It can be that simple. But if you barely know the person, the message might be more like “I’d like to better understand what you do and what your challenges are, and also I’d like to tell you about my work and the kinds of issues I help my clients with.” Or, you might decide on a less direct approach and ask if you could interview them for an article you’re writing or invite them to attend an event or networking function that you think would benefit them. When doing this type of personal outreach, your goal is to get at least a phone call and ideally a face to face meeting. An in-person meeting is much more powerful and creates vastly more personal rapport than a phone call. Offer fun—a meal, a social or sporting event. These executives may not really know who you are and what you do—and vice-versa. So your challenges are to learn more about them and to educate them. For an expressed issue, offer to put together a brief outline or proposal for how you’d approach it, or to send them a specific article you’ve written that addresses it. 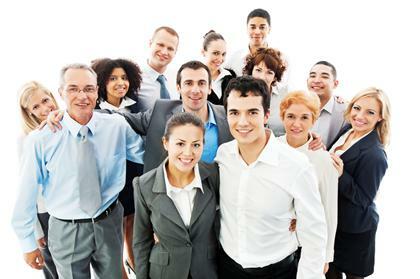 Invite them to an event with current and past clients who can talk about what you do. You may have some prospects that you’d like to meet but don’t currently know. As I noted earlier, that’s also a very important challenge, which I’ll address in a future newsletter. You can develop more leads from your network if you approach the job systematically, prioritize your efforts, and keep the four principles in mind: Add value, understand their agenda, evoke their curiosity, and maintain frequent contact. The graphic, below, summarizes this overall strategy.